Dr. Steve Loerch has accepted the position of Professor and Head, Department of Animal Sciences. Steve is a Pennsylvania native who received his BS degree from Pennsylvania State University and his MS (1978) and PhD (1981) degrees from the University of Illinois. He has been a member of the faculty at The Ohio State University for 30 years, where he had a distinguished career in teaching and research. Dr. Loerch's research career at Ohio State featured over 132 peer-reviewed publications and over $3.5 million in funding from federal and industry sources in the last 10 years. He has received numerous awards and honors for teaching and research, culminating in 2013 with the American Society of Animal Science Research Fellow Award. His ability to investigate basic biological processes and apply them to industry production scenarios has been a strong point of his research. Dr. Loerch has distinguished himself in his instructional programs with extremely high and consistent reviews over a variety of courses for many years; the development of capstone learning activities for undergraduates in Animal Sciences; and a strong contingent of graduate students who have continued with great success in academia and commercial companies in agriculture. Off campus, Dr. Loerch is an instrumental member of national research committees and has been an invited speaker throughout Central and South America. Dr. Loerch will join us in early March. In the spirit of institutional cooperation, the Big Ten schools with agricultural programs are once again gathering our alumni and friends in the Washington, D.C. area for a special event -- this year at a new location, the National Press Club on Monday, March 3, 2014. Now in it's fourth year, the reception has been a great success with alumni and friends networking across institutions and enjoying one another's company. We are looking forward to seeing everyone again (and some new faces!). Please join us at the National Press Club for heavy hors d'oeuvres and beverages and enjoy the fellowship of alumni and friends from the colleges of agricultural sciences and natural resources representing Michigan State University, The Ohio State University, Penn State University, Purdue University, Rutgers University, University of Illinois, University of Maryland, University of Minnesota, University of Nebraska, and the University of Wisconsin. Reconnect with college deans, administrators, faculty and staff from your Alma mater. Learn how our colleges are working cooperatively on behalf of land-grant institutions. 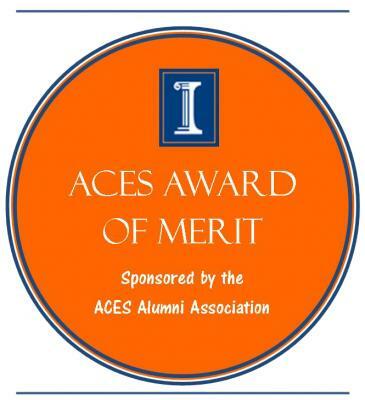 The College of ACES Alumni Association is pleased to announce the 2013 ACES Award of Merit winners. Margaret Barth, Ph.D. '91 Food Science & Human Nutrition of Riverside, CA. 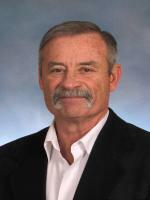 Jerry R. Brookhart, B.S. '63 Agricultural Science of Macomb, IL. Jerry serves as a Insurance Producer at Purdum Gray Ingledue, Inc.
Kenneth L. Dalenberg, B.S. '71 Agronomy, M.S. '04 Crop Sciences of Mansfield, IL. Kenneth serves as the Director of the Illinois Soybean Checkoff Board. Larry H. Hageman, B.S. '78 Agricultural Sciences of Rochelle, IL. Larry serves as the Research Field Station Manager/Territory Manager at DuPont Crop Protection. Barbara P. Klein, Ph.D. '74 Home Economics of Champaign, IL. Barbara is Professor Emerita, Department of Food Science & Human Nutrition at the University of Illinois. It is that time again to begin thinking about ACES Alumni Association Awards! Outstanding Young Alumni – Due May 15, 2014. Each year the College of ACES Alumni Association honors up to three outstanding graduates of the College of Agricultural, Consumer and Environmental Sciences who have demonstrated outstanding professional achievement, or through outstanding leadership or service have significantly enhanced or improved the lives of others. 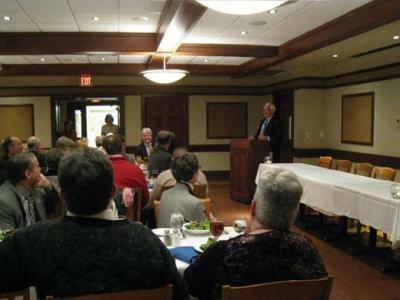 On Friday, January 24, the College of ACES welcomed "home" University President Robert Easter as the keynote speaker for An Evening with the Voices of Illinois Agriculture. I found it particularly enjoyable to watch the generous attendees of this event enter in to welcome conversations with President Easter. Indeed, they were conversations amongst friends. The events for the evening kicked off with a cocktail hour and dinner prepared by students in the Hospitality Management program, and concluded with an Agricultural Outlook Panel sharing their thoughts on the upcoming growing season. Diners offered a milk toast, homage to the agriculture focus of the evening, in celebration of the evenings' festivities. This special event was held in support of the ACES Hospitality Management undergraduate program at the University of Illinois as well as the College of Agricultural, Consumer and Environmental Sciences scholarship program, which benefits students by providing an investment into one's education. We thank the generous donors, "Todd Gleason and Friends," who made this event possible once again. The winter issue of ACES @ Illinois is now available online! A great resource to learn what is happening on campus! Looking to bring a prospective student to campus? Know someone that would be interested in studying at ACES? Mark March 14-15, 2014 for the tenth annual ExplorACES to be held on campus. More information to be announced soon! Watch the ExplorACES website for more info! The University of Illinois and the Department of Intercollegiate Athletics is proud to introduce an exciting new campus Illinois Pride initiative, "Paint the Highway Orange Campaign". In an effort to spread orange and blue loyalty across Illinois, landowners are being sought with farmland property along interstates or major highways. Participants in this new program will receive one to five consecutive signs, often referred to as Burma-Shave signs, to place along the edge of their property which is along an interstate or state highway. As Illinois residents and visitors travel throughout the state, their attention will be drawn to these fun and witty signs that will celebrate Illinois and our world-class university. The plan to launch this campaign will begin this Spring. If you would like to be considered for participation in this new initiative and show your Illini Spirit, please contact Kathy Plunk, Marketing Communications Coordinator at 217-333-3631 or by email at kplunk@illinois.edu. 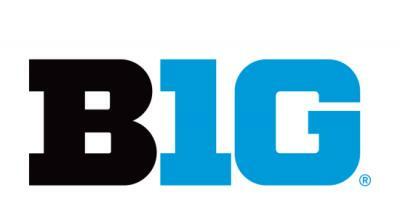 Headed to the Big Ten Tournament? Join the College of ACES for an informal pregame event in Indianapolis! NO RSVP required. Please join us! Have you connected to your alumni network? Looking for a friend from college? Know where the closest Illini Club is near you? Looking for alumni or campus news? Check out the UI Alumni Network - http://www.uialumninetwork.org/index.html. A great resource for you to stay connected with your alma mater or reconnect with Illini friends! U of I College of ACES and U of I Extension are collaborating on a cross-campus initiative to inform and help people make educated decisions on the Affordable Care Act (ACA) also referred to in the news as "Obamacare." The website includes information about the ACA law; specific information for Illinois residents; and various resources that are available.